So today I had a little bit of time to check out Pytacle. I knew from the beginning that it is alpha-quality software, but I still had some expectations. Many times people in the open-source community “advertise” their software as “alpha, as-is, no guarantees” and then it turns out that the code is pretty functional and does the stuff it is supposed to do. Very humble folks, really appealing. However with Pytacle this was different: it promised a lot of things to do (“Â It automates the task of sniffing GSM frames of the air, extracting the key exchange, feeding kraken with the key material and finally decode/decrypt the voice data. “) but it failed to achieve anything like that. First of all I looked at the code, which was surprisingly simple compared to the feature list (for example GSM Analyzer tries to do around 2/3 of the stuff Pytacle promises and it has a large codebase consisting of many classes and files) and however I would never judge a program based on its source code’s size (that would truly be horrible) I was still getting skeptical of the single .py file containing mostly GUI definitions. 2. and sadly it doesn’t do very well. It has magic numbers in it hardcoded (“0B” always for Configuration, “06 3f” for Immediate Assignment) which not seem to perform well (or to be honest: at all) in my environment. I actually tried changing the configuration to 0C, which is the way mobile carriers operate in my country, and fed Pytacle a file with 5 different Immediate Assignments. It told me “No immediate assignments found, sorry…” and it exited. So, to come to a conclusion: I really appreciate the effort David put into this script, but right now it is useless. It goes through the whole GSM cracking procedure, but it naturally lacks the human intelligence currently needed to distinguish between different Immediate Assignments, cell configurations etc. so it’s almost always destined to fail on you. It is possible to create such input files (basically cleaning out junk from a real-world file, or run a test-network and capture its traffic) which it can interpret and work on, but that is not going to help someone who would like to try stuff on a real network. In case you missed Camp0 or dnet’s tweet about it here is my Camp0 presentation video. It is not perfect at all, it has some inaccuracies in it, also demo effect is kicking in hard, but to save myself I need to say that I was preparing to get this done for Hacktivity (2 weeks after Camp0) so this is a semi-finished thing. So. I had some requests asking me about how I did what I did with GSM. What tools did I use, what hardware and what options? Since I believe strongly that GSM needs to be â€œout in the hands of the peopleâ€ meaning everybody should have access to cheap hardware and free, opensource software that helps understanding GSM in practice I thought I will create a series of write-ups describing the whole process from the beginning. DISCLAIMER: EVERYTHING DESCRIBED HERE IS ONLY FOR EDUCATION PURPOSES. ONLY DECODE YOUR OWN DATA, NEVER TRY TO DECODE ANY DATA THAT IS NOT YOURS/YOU DON’T HAVE PERMISSION TO DECODE, RESPECT THE PRIVACY OF OTHERS! I don’t take responsibility for how you use the konwledge you gained here. Naturally instead of ARFCN you need to specify the ARFCN number, the -d switch tells the program to give us the downlink frequency (-u would give us the uplink). A new window will pop up, click in the middle of the GSM channel in the Wideband Spectrum window. Within a few seconds some GSM data should begin to show constantly in wireshark. 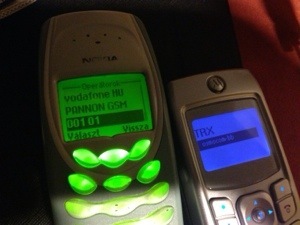 Type ./gsm_receive_rtl.py -h for information on more options. The -s flag is used here to set the sample rate to 1.0 MSPS, which seems to work much better than the default of 1.8 MSPS as it seems that there should be only one GSM peak in the wideband spectrum window. 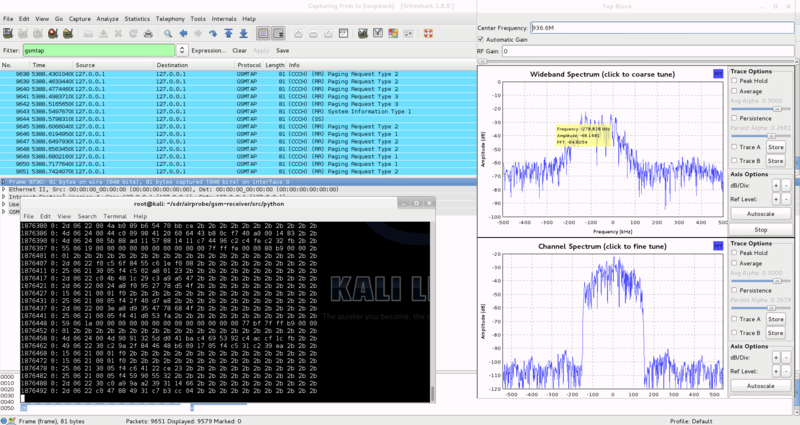 then you should calibrate your RTL-SDR stick using the kalibrate-rtl program, described here. After you determined the offset of your RTL-SDR calculate average of the different offset values. You will get something like this for example: +24.7 kHz. This actually is 24700 Hz, the plus means that the RTL-SDR tunes itself generally around 24700 Hz ABOVE the frequency you set it on, so you need to SUBTRACT this frequency from the result you got with ARFCNcalc. If your average offset is negative then naturally you need to ADD the average offset to the result of ARFCNcalc instead of subtracting it. Use the new frequency to fire up RTL-SDR again, and let it warm up for some minutes. You should see some improvement compared to the first, uncalibrated test. I wasnâ€™t able to find a way to use airprobe to capture my own cfile. I did find a way to capture one using ./rtl_sdr and GNU Radio however. Next, downloadÂ this GNU Radio Companion (GRC) flow graphÂ (scroll all the way down for the link), which will convert the rtl_sdr .bin file into a .cfile. Set the file source to the capture.bin file, and set the file output for a file called capture.cfile which should be located in the â€˜airprobe/gsm-receiver/src/pythonâ€™ folder. Also, make sure that â€˜Repeatâ€™ in the File Source block is set to â€˜Noâ€™. Now execute the GRC flow graph by clicking on the icon that looks like grey cogs. This will create the capture.cfile. The flow chart will not stop by itself when itâ€™s done, so once the file has been written press the red X icon in GRC to stop the flow chart running. It will probably work for you just fine, data will flow into Wireshark as expected. The 64 is the decimation rate of the RTL-SDR, 0b is the configuration go.sh is going to use: 0 means Timeslot 0 (beacon channel), b is the configuration the cell uses on the beacon channel (see the ‘Signaling Channel Mapping’ inÂ this chapter of ‘Introduction to GSM’ to see what this means). 0B : TS0  "FCCH + SCH + BCCH + CCCH"
If you look at the traffic in Wireshark but it doesn’t seem to be right (for example you made a call or sent a text message while capturing but the Ciphering Mode Command is missing) it is pretty sure that you are using the wrong configuration (0b instead of 0c or vise versa). It is important to try both and figure out which one is correct for the cell you are observing. I will assume you sent a text message to yourself while capturing data. So now you can see all the messages of the beacon channel, but what are you looking for in the Wireshark log? 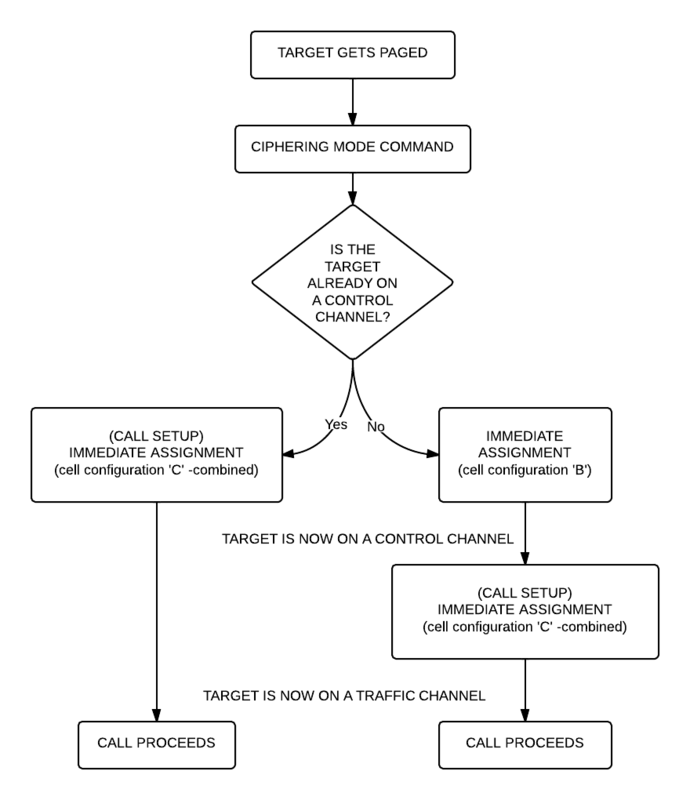 It is quite simple: first a “Paging Request” for the TMSI of the target phone, then a “Ciphering Mode Command”. These are the messages which indicate that a transaction actually happened. How to get the key? I already posted about that. 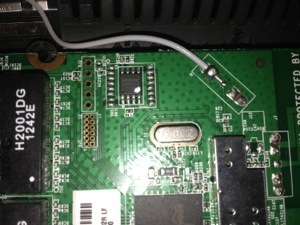 Since we are testing using our own equipment we have access to the SIM card, so we can extract the key. It is best to extract the key immediately after you did a capture with RTL-SDR because depending on the network configuration the key could change. Notice that I did not only change the Timeslot number from 0 to 2, but also the configuration from C to S, because the target phone is now on a Standalone Dedicated Control Channel (SDCCH), not on the beacon channel so we need to decode it differently. Also worth noting that SMS messages are almost always sent on the Control Channel not on the Traffic Channel. Now that we were able to decode an SMS let’s get to something a little bit harder: decoding a voice call! All right, what should we see now? Logically there needs to be an “Immediate Assignment” command, because the phone NEEDS to change at least once to a different timeslot to receive voice data (to a Traffic Channel, Timeslot 1-7). 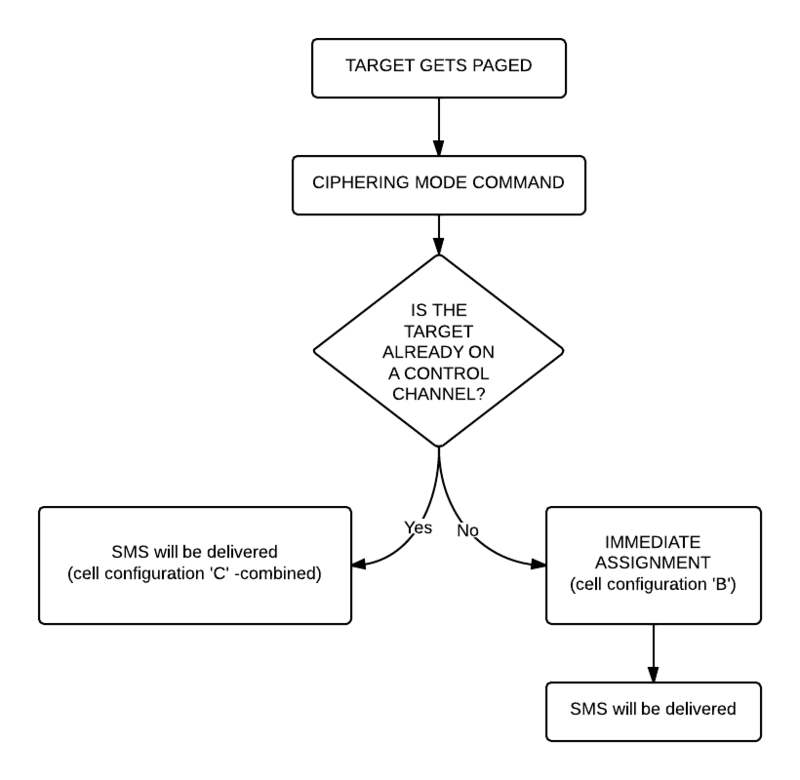 Â What we saw when decoding the SMS is correct here too: depending on the network configuration we can see some messages about the call setup (if it is an incoming call we can even see the caller ID – the phone number calling our target) then an “Immediate Assignment” (configuration ‘C’ – combined) or we can only see an “Immediate Assignment” directing the phone to a Control Channel (just like it happened when receiving an SMS, configuration ‘B’). Of course if you follow the phone to the Control Channel you will see the call setup messages (in case of an incoming call) then another “Immediate Assignment” command, this time directing the phone to a Traffic Channel. Now there is only one question left: how do we decode the traffic channel to actually get the voice data? UPDATE: I also uploaded my slidesÂ from Hacktivity. The script I used at Hacktivity needs to be finalized, also the Android app (SilentSMS) needs some re-factoring, so this step is going to be released later. UPDATE (19/10/2013): I started fixing the code, first up is the Android app which seems to be ready from my point of view, but since I haven’t checked it with anyone else I am going to say it is alpha quality code, a little bit better than a PoC. So, you now have a way of sending silent text messages, so you now you just needÂ to monitor all the paging requests. You can use RTL-SDR for that or osmocomBB. The thing left is to collect all the TMSIs, and try to figure out from them which is the one you are looking for. First observe the paging requests (especially the TMSIs in them) on the console – how many times is the same TMSI paged? Some networks page 2, even 3 times and then continue with the transaction, so if you sent 3 SMSes you will see a TMSI being paged 6 times, not 3 times as one would expect.Â So you need to create a script that counts how many times is a TMSI paged based on the output of RTL-SDR (+ tshark + a good wireshark filter) or osmocomBB and while doing that it sends out silent SMS messages via the telnet interface. After 2-3 messages you can see how many TMSIs you have with 2 (or 4)-3 (or 6) pagings.Â If you get multiple results you can eliminate the wrong ones easily by sending more SMSes, but monitoring only the TMSIs you got from the previous run. The big GSM write-up â€“ how to capture, analyze and crack GSM? â€“ 2. An easy way to install a native Linux system is using Wubi. This article is the best, it simply covers the whole process from A to Z. It is important to know that decoding GSM requires quite an amount of processing power (even more if you do it in real-time using gsm_receive) so if you use it in a virtual machine don’t forget to give it at least 2 processor cores. On my machine (Core i5 first generation) using just one core gsm_receive wasn’t usable at all. I assume you completed the first step, so you already have libosmocore installed (!). If everything is fine your phone should have the RSSI firmware loaded. If you get errors while loading the firmware you need to make sure your cable is fine and you are not using a virtual machine (the virtualized USB controller tends to mess up timings causing the chainloader code to fail). Now that you can compile and run OsmocomBB code you will be able to run the my modified version of it (will be posted soon). The big GSM write-up – how to capture, analyze and crack GSM? – 1. Since I believe strongly that GSM needs to be “out in the hands of the people” meaning everybody should have access to cheap hardware and free, opensource software that helps understanding GSM in practice I thought I will create a series of write-ups describing the whole process from the beginning. First Step: understanding the basics of GSM, what’s the theory behind GSM-cracking? GSM (Global System for Mobile communication) was introduced as a standard in 1991. The cipher used in GSM hasn’t been really well known but already in 1994 Ross Anderson published a theory about how to crack the encryption. Later many people contributed to this theory essentially making GSM theoretically broken since 2003, but practical tools existed only for governmental organizations and mobile operators for such high prices nobody from the hacker community could buy them (not mentioning none of the manufacturers would have given him/her anything). And this was the time when Karsten Nohl decided to dedicate some years as a researcher and as a manager to create both software and hardware that could turn theory into reality. Every single year since 2009 Karsten and one member of his team released something, a milestone if you wish, which contributed to the death of myth that GSM is secure. I am not listing 2011 here because there was no code released in that year (since the presented solution was a full blown GSM eavesdropping attack there was nothing to be released). So, the landscape of GSM hacking consists of two hardware options: USRP or OsmocomBB. The USRP costs a lot, OsmocomBB has pretty much no code available. My ideal setup would be a combination of these two: cheap hardware and software already available. Is there such a solution? Yes, there is. You can use an RTL-SDR stick to capture GSM data from the air, just like you would do with a USRP. It is not as accurate, it does lose sync sometimes, but it works. And not only for single transmissions (SMS) but also for calls. I tested both, and I can confirm that it works. So, now we have an established platform: we are going to sniff single frequency (non-hopping) GSM downlink-traffic. These are our limitations, airprobe is only capable of decoding the downlink and RTL-SDR isn’t capable of hopping along (although in theory you can use more sticks and lock each of them to a frequency and then re-construct the transmission by combining data from all dongles). UPDATE: The page I referenced here went offline, so here is a PDF containing all its content. TMSI stands for Temporary Mobile Subscriber Identifier which is used on GSM networks to avoid the transmission of any information that would possibly identify a certain person (customer). We need to know this ID so we can tell when the victim is being paged (meaning that he/she is going to receive something from the network – call or SMS). The ideal “thing” to send is a silent SMS: it will not show up at all on the victim’s phone (no sound, no notification, nothing) but we will get an acknowledge from the victim saying that our SMS was delivered. Example scenario: we observe pagings and figure out that they page twice for each transaction, so if we send 3 silent messages there should be a TMSI which has been paged 6 times. By altering the number of messages sent we can quickly distinguish false positives from the real answers. Test results: I actually did this attack at Hacktivity with a room full of people (meaning that the cell serving us was quite busy) and on my first attempt using 3 messages I only got two results back (meaning one of them was a false positive). Repeating the process would probably eliminate the false positive easily (there is very little chance that the same false positive would show up). Since GSM cracking is based on knowing the content of encrypted bursts we need to figure out some information about the cell’s configuration. But wait you might say, what’s the point of this, ‘knowing the content of encrypted bursts’ renders encryption useless, doesn’t it? Yes and no. Of course if you know the content of something that is encrypted there is no point in encryption. But in case of GSM it isn’t so simple: there are some bursts that are transmitted periodically, usually containing information about the system (System Information bursts). The only rule about these bursts is that they need to be transmitted no matter what. Even if the connection is currently encrypted these bursts will be transmitted (naturally in encrypted form). and so on. As you can see the pattern repeats itself, just the type of the System Information changes, but for example there is always an empty burst at the end. This is just a fictional pattern but I hope you see the idea: some of these bursts are transmitted even if the connection is encrypted. The result is the so called keystream (that comes out of the encryption function A5/1). Guess what do we need to feed our cracker, Kraken with? Yep, A5/1 keystream. The challenge of course is to determine which burst of all the encrypted ones is the one containing in this case the System Information Type 5 message (again, we could have chosen any other message which has a known content). That’s why we need to analyze the cell’s configuration and make maybe one-two test calls to see the call setup. Usually the call setup always happens the same way, so once you figured out what messages are sent during a call-setup you can safely assume that the same messages will be transmitted whenever there is a call-setup. That’s pretty straight forward: download the 1.6 TB of rainbow-tables, write them out to a hard drive and then fire up Kraken. Since GSM could be running in many different configurations you might need to try out more config. options of the tool go.sh to get it working properly. Otherwise there isn’t anything fancy about this step, all you need to do is pretty much giving it the key, the filename and ‘let it do the magic’. This is the end of the first part of the series. I covered just the history of GSM hacking, what hardware do we have to do GSM hacking and basic theory behind the attack. In the next part we are going to set up our environment, then start real hacking with it. Stay tuned! I am quite a fan of Tesla cars. They are showing a quite probable future which I think is a good way. Actually I really like what Elon Musk does in general. So when all the newspapers today were filled with the story of a Model S catching on fire and burning out I was quite certain we will hear from Elon especially because the story had a horrifying twist in it: the firemen didn’t have any training about how to handle such a situation. As a side note I would like to mention that the Hungarian firemen just recently received special training from Toyota and Nissan about handling fires which involve electric/hybrid cars. Earlier this week, a ModelÂ S traveling at highway speed struck a large metal object, causing significant damage to the vehicle. A curved section that fell off a semi-trailer was recovered from the roadway near where the accident occurred and, according to the road crew that was on the scene, appears to be the culprit. The geometry of the object caused a powerful lever action as it went under the car, punching upward and impaling the ModelÂ S with a peak force on the order of 25 tons. Only a force of this magnitude would be strong enough to punch a 3 inch diameter hole through the quarter inch armor plate protecting the base of the vehicle. The ModelÂ S owner was nonetheless able to exit the highway as instructed by the onboard alert system, bring the car to a stop and depart the vehicle without injury. A fire caused by the impact began in the front battery module â€“ the battery pack has a total of 16 modules â€“ but was contained to the front section of the car by internal firewalls within the pack. Vents built into the battery pack directed the flames down towards the road and away from the vehicle. When the fire department arrived, they observed standard procedure, which was to gain access to the source of the fire by puncturing holes in the top of the battery’s protective metal plate and applying water. For the ModelÂ S lithium-ion battery, it was correct to apply water (vs. dry chemical extinguisher), but not to puncture the metal firewall, as the newly created holes allowed the flames to then vent upwards into the front trunk section of the ModelÂ S. Nonetheless, a combination of water followed by dry chemical extinguisher quickly brought the fire to an end. It is important to note that the fire in the battery was contained to a small section near the front by the internal firewalls built into the pack structure. At no point did fire enter the passenger compartment. Had a conventional gasoline car encountered the same object on the highway, the result could have been far worse. A typical gasoline car only has a thin metal sheet protecting the underbody, leaving it vulnerable to destruction of the fuel supply lines or fuel tank, which causes a pool of gasoline to form and often burn the entire car to the ground. In contrast, the combustion energy of our battery pack is only about 10% of the energy contained in a gasoline tank and is divided into 16 modules with firewalls in between. As a consequence, the effective combustion potential is only about 1% that of the fuel in a comparable gasoline sedan. The nationwide driving statistics make this very clear: there are 150,000 car fires per year according to the National Fire Protection Association, and Americans drive about 3 trillion miles per year according to the Department of Transportation. That equates to 1 vehicle fire for every 20 million miles driven, compared to 1 fire in over 100 million miles for Tesla. This means you are 5 times more likely to experience a fire in a conventional gasoline car than a Tesla! For consumers concerned about fire risk, there should be absolutely zero doubt that it is safer to power a car with a battery than a large tank of highly flammable liquid. Thanks for the support. I completely agree with the assessment to date. I guess you can test for everything, but some other celestial bullet comes along and challenges your design. I agree that the car performed very well under such an extreme test. The batteries went through a controlled burn which the internet images really exaggerates. Anyway, I am still a big fan of your car and look forward to getting back into one. Justin offered a white loaner–thanks. I am also an investor and have to say that the response I am observing is really supportive of the future for electric vehicles. I was thinking this was bound to happen, just not to me. But now it is out there and probably gets a sigh of relief as a test and risk issue-this “doomsday” event has now been tested, and the design and engineering works. Â On Oct 3, 2013, at 12:29 PM, Jerome Guillen wrote: Dear Mr. Carlson: I am the VP of sales and service for Tesla, reporting directly to Elon Musk, Tesla’s CEO. I am sorry to hear that you experienced a collision in your ModelÂ S 2 days ago. We are happy that the ModelÂ S performed in such a way that you were not injured in the accident and that nobody else was hurt. I believe you have been in contact with Justin Samson, our service manager, since the accident. We are following this case extremely closely and we have sent a team of experts to review your vehicle. All indications are that your ModelÂ S drove over large, oddly-shaped metal object which impacted the leading edge of the vehicle’s undercarriage and rotated into the underside of the vehicle (“pole vault” effect). This is a highly uncommon occurrence. Based on our review thus far, we believe that the ModelÂ S performed as designed by limiting the resulting fire to the affected zones only. Given the significant intensity of the impact, which managed to pierce the 1/4 inch bottom plate (something that is extremely hard to do), the ModelÂ S energy containment functions operated correctly. In particular, the top cover of the battery provided a strong barrier and there was no apparent propagation of the fire into the cabin. This ensured cabin integrity and occupant safety, which remains our most important goal. We very much appreciate your support, patience and understanding while we proceed with the investigation. Justin keeps me closely informed. Please feel free to contact me directly, if you have any question or concern. All right, what do we have? Facts which seem to be legit – check, a little bit of background from a guy who actually designed and engineered the car – check, excerpts from a quite probable email conversation between Tesla and the customer-check. I think this is a perfect way to handle such a situation. Well done Mr Musk, well done.